Former Deputy National Security adviser Elliott Abrams comes out in support of releasing Jonathan Pollard. Former U.S. Deputy National Security adviser Elliott Abrams has joined a large number of former high-ranking American officials who have called for the release of Jonathan Pollard. Speaking to i24News, Abrams said, "I don't think he's a hero, but the way to judge it is by the normal treatment like other cases of espionage and it's hard to find someone - particularly in the case of a friendly country - that has been imprisoned for 29 years." "I think that here is a just and a humanitarian case for his release," he added. Pollard has been held in the United States for more than 28 years on spying allegations. He was arrested by FBI agents in 1985 and held ever since. In recent years, several American officials – including former CIA officials – have recommended releasing Pollard. Several months ago, Lawrence Korb, United States Assistant Secretary of Defense during the Jonathan Pollard affair, appealed to U.S. officials to let Pollard go. Besides Korb, former CIA chief James Woolsey has also called for Pollard to be released. Most recently, two former U.S. ambassadors to Israel, Samuel Lewis and Thomas Pickering, called for Pollard’s release. Both were against the idea until now. 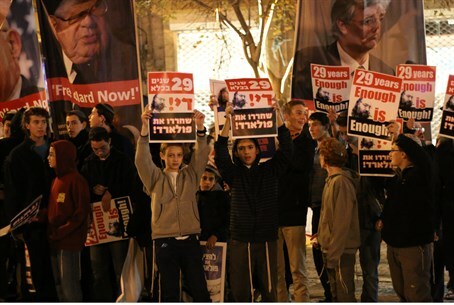 Calls for Pollard’s release have increased since it was revealed that the U.S. had been spying on top Israeli officials. Pollard was arrested on charges far less serious, critics noted, and slammed the American government over its "hypocrisy".